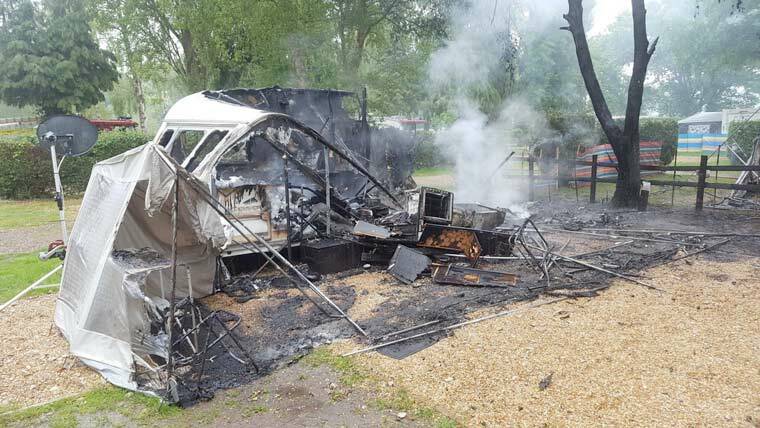 Caravan owners are being encouraged to install smoke alarms and check them regularly after a caravan fire at a holiday park in Holton Heath on 24 May. Dorset & Wiltshire Fire & Rescue Service has reported that four fire engines, from Wareham, Poole and Hamworthy attended a caravan blaze at Holton Heath on 24 May and used hose reels and breathing apparatus to extinguish it. Station manager Stuart Granger, who attended the incident said, “Fortunately, no one was hurt on this occasion, but if the fire had happened a few hours earlier, the outcome may have been very different. The caravan where the fire started and two others were totally destroyed. Check all gas fittings. Use arrester valves on gas bottles and make sure your caravan is adequately ventilated.